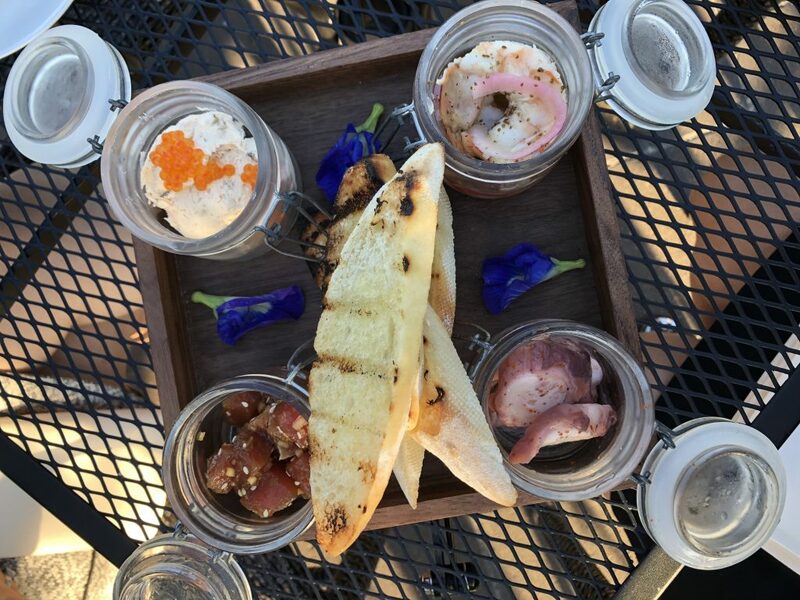 Showcasing the best bites in Austin! I’ve been working from Houston almost weekly since last summer and I’ve had the chance to explore a ton of restaurants near Downtown that I would never have ventured out to when I lived in Sugar Land back in grad school. 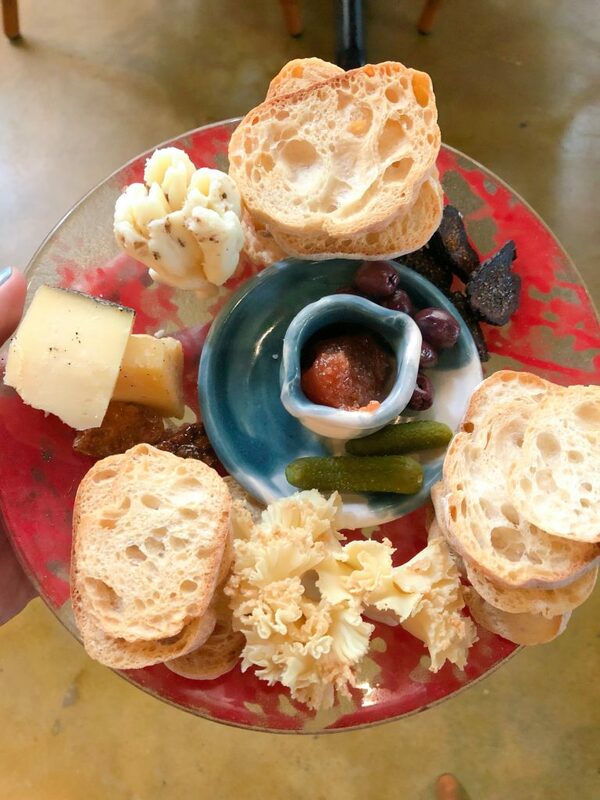 I’ve just scratched the surface and will be adding to this list as I continue on my foodie adventures, but in the meantime, here is a Vessel interactive map with pins and then all the deets on the hot spots that made the cut down below! 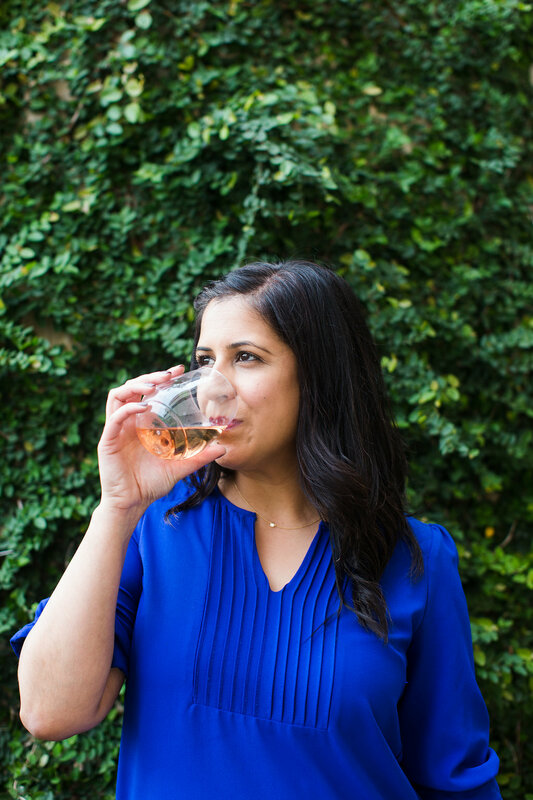 My coworkers are absolute gems and so fun to be around – we’re friends in #IRL – and the first place they took me when I started my stint in Houston was Coltivare Pizza & Garden. We got there relatively early (around 5:30) and got three seats at the counter. If you don’t want to wait a while, I’d suggest getting there early as well! 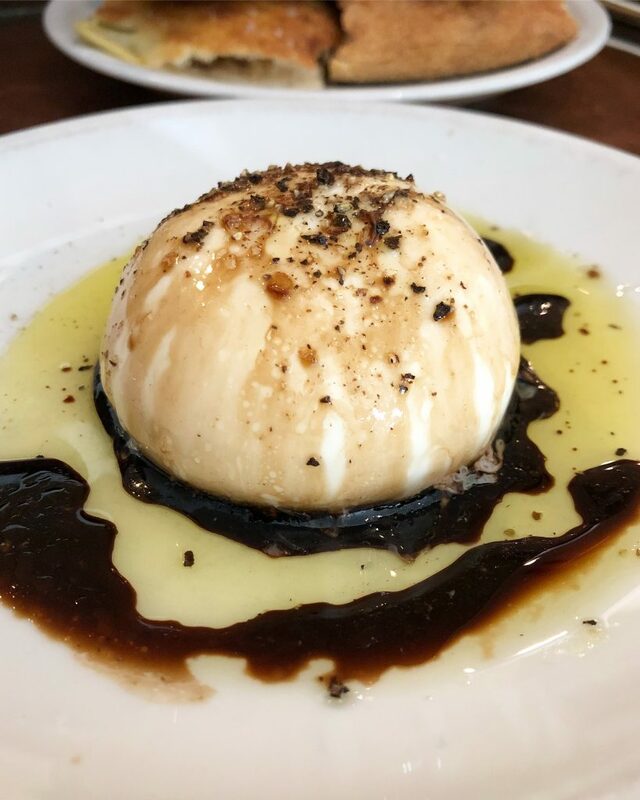 The Burrata was a standout dish! Never leave without a pizza! Ever! 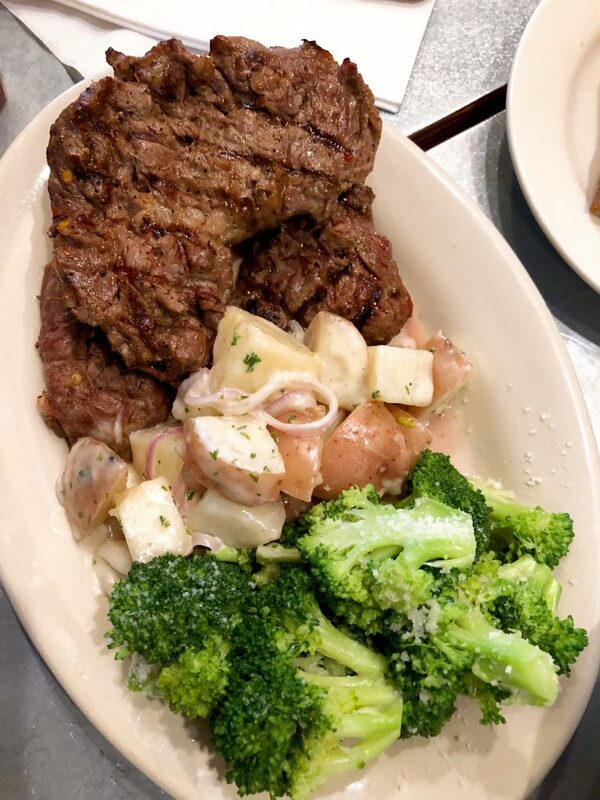 Another absolute must-dine Italian spot that everyone in town knows about is Paulie’s. I’ve been at least 5 times in the last 6 months because it’s just THAT GOOD! 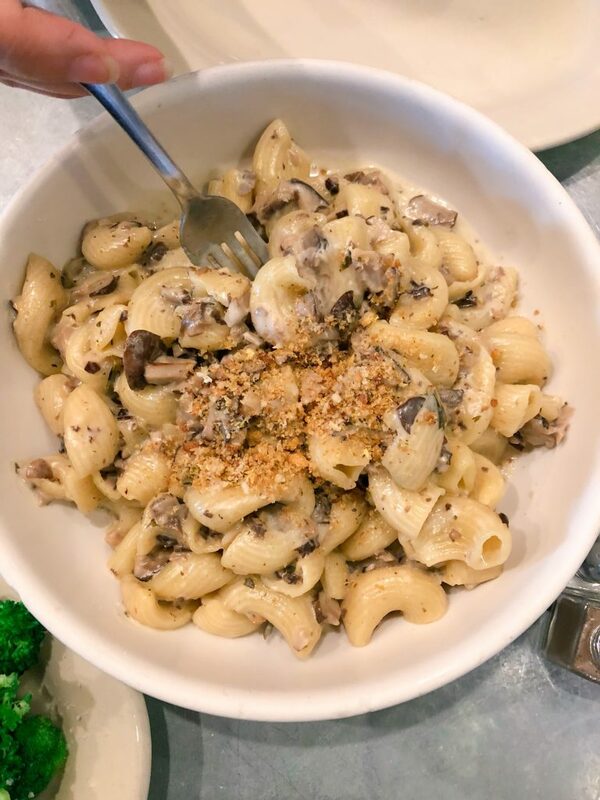 If you’re a fan of pasta, this spot is for you. Like for real, amazing pasta. A great spot with super chill and fancy vibes at the same time is Riel. Near Paulie’s, I passed by this spot and was intrigued. Made a reservation since there were 10 of us going and at 6PM they weren’t super packed (yet). If Steak Tar Tar is your jam, then Riel’s is for you. And it was a work of art! 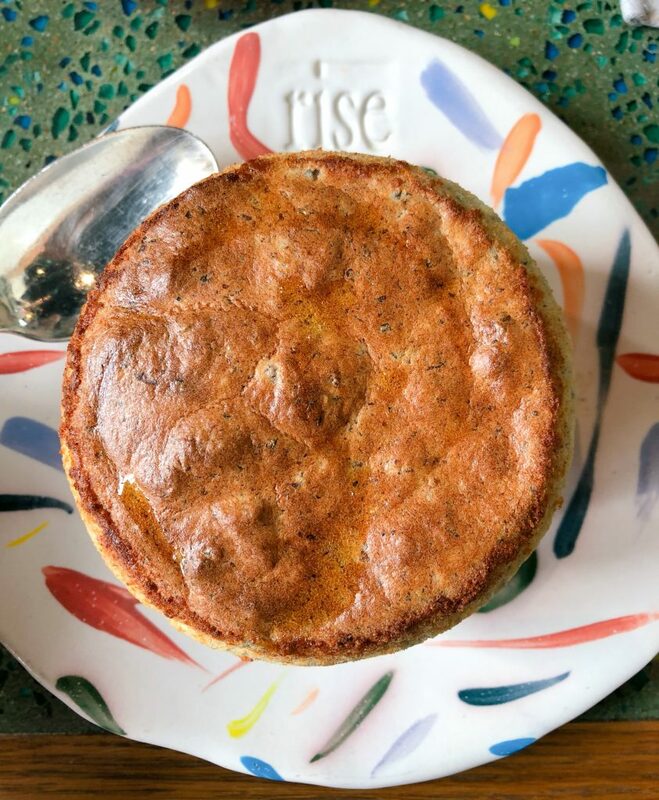 I don’t know where or how I discovered Rise (most likely Instagram), but when I walked in their location, I fell in love with everything. The ambiance is whimsical, the staff are helpful and so kind, and the food is divine! I long for the day they open one in Austin, but until then, I’ll just have to continue to dine at the Houston location over and over again. I’ve taken several different groups and I’ve been 4 times already. Don’t worry, if you don’t like souffles or think they’re too heavy for normal consumption, their Rise Salad with Tuna is my go-to and it’s gorgeous! I love Rise so much, it has it’s own blog post here so if you haven’t had a chance to check it out, do so now here. 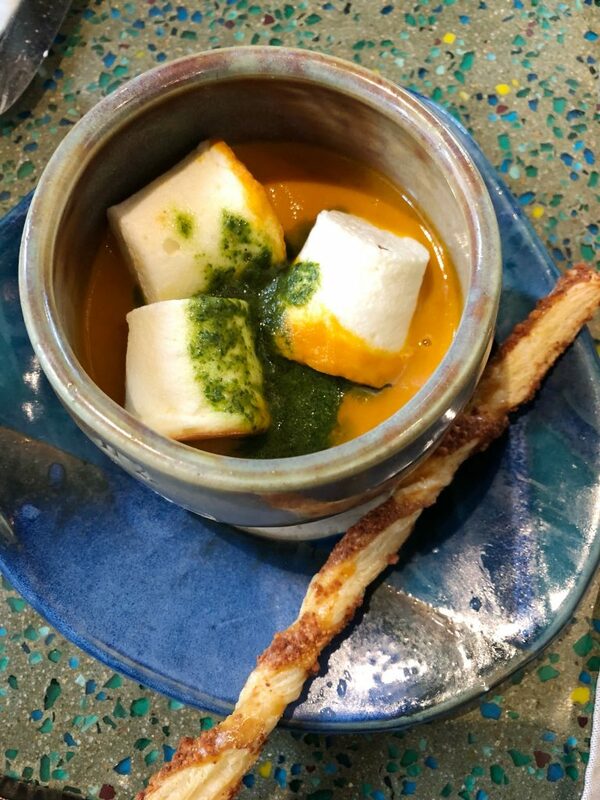 I highly recommend the Marshmallow Soup – a carrot and tomato bisque with goat cheese marshmallows – so creative right? We went to the Provisions portion of this joint restaurant. 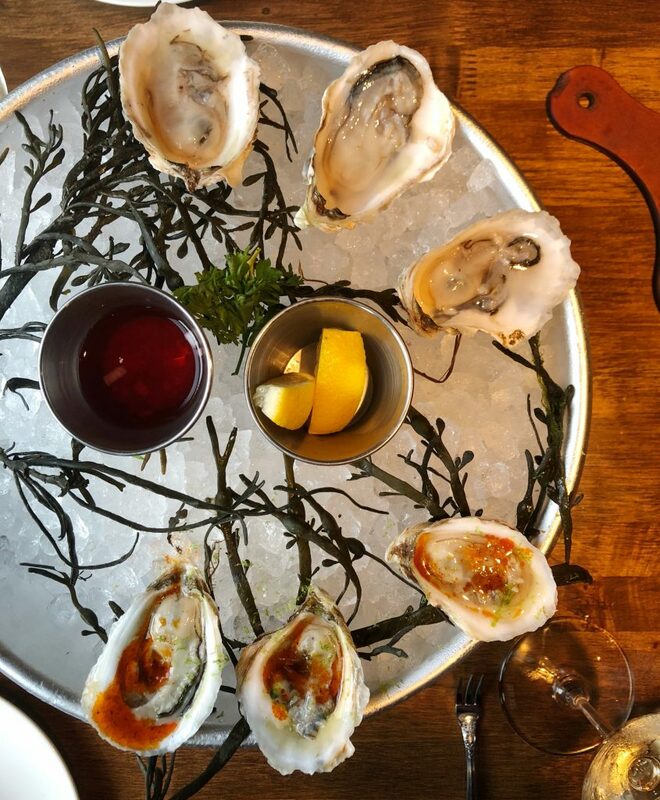 Pass is more of a tasting menu (Chef’s Table concept) and Provisions is a neighborhood, casual setup. The building was constructed back in the 50’s and was home to an Italian import warehouse. 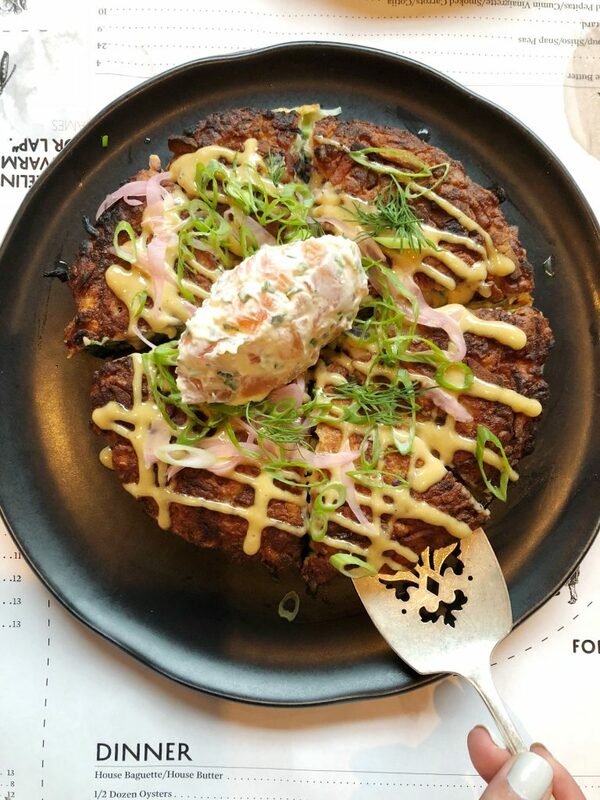 The menu changes regularly but stand out dishes were definitely the Oysters, Squid Ink Cavatappi and the Okonomiyaki. We tried several more dishes and enjoyed each one. Will definitely be back! These oysters were delish! Love the table setting (you can see in the background). You’ll find the original Moku in the Conservatory (Downtown Houston’s food hall with a few restaurants, a brewpub and a wine bar). I say original because Moku is about to open a brick-and-mortar in the Heights very soon. 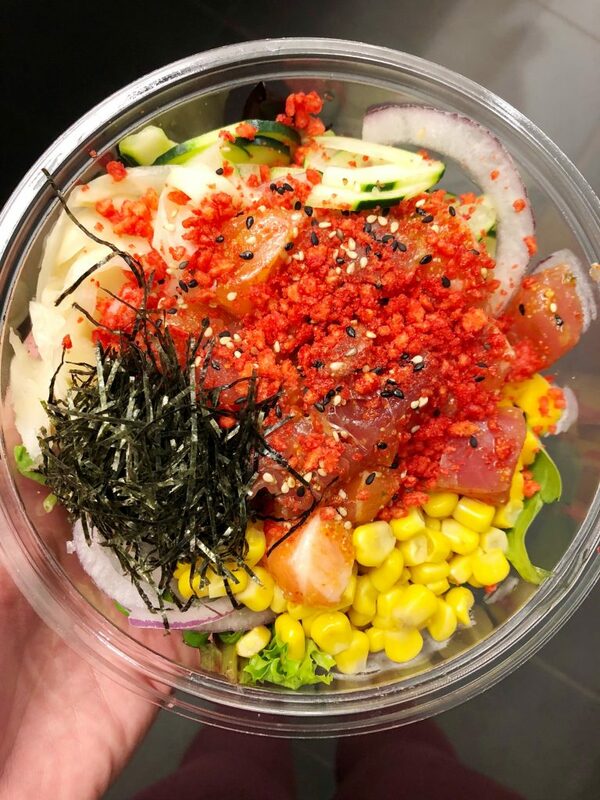 I was working in Houston in the summer when all I wanted was poké every evening after working out. Enter, Moku! They were available on UberEats too so I’d just order in and devour a bowl after working out. Always get the Flamin’ Hot Cheetos on top, k? 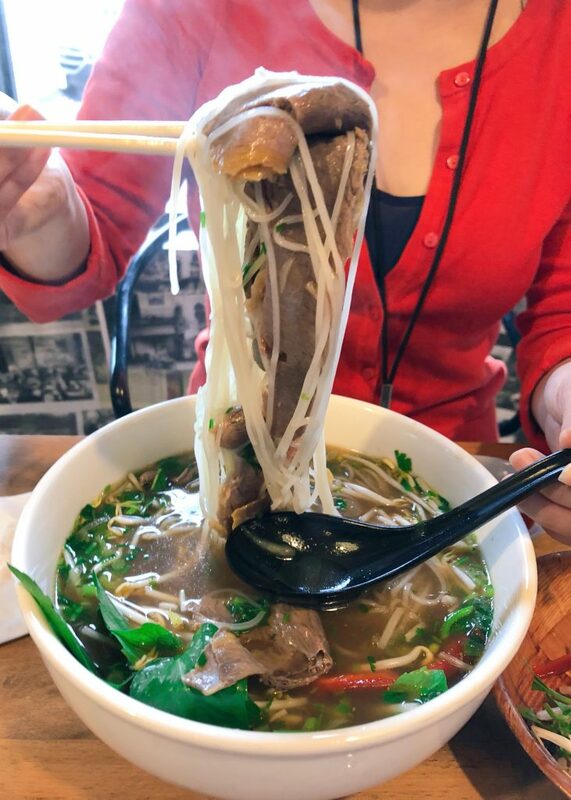 For all those of you who like beef options for your Pho Bo, they’ve got tendon, shank, filet, meatball and brisket! Pondicheri has a special place in my heart. 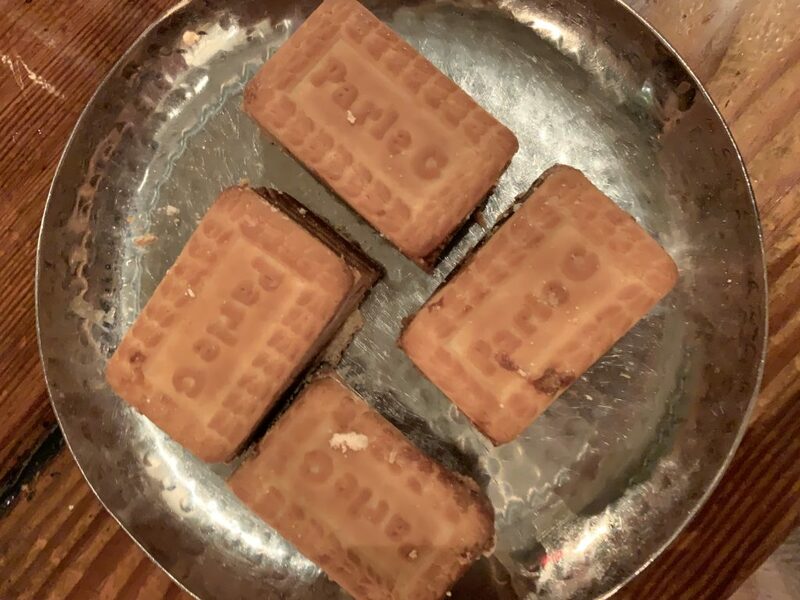 They serve these delish (super nostalgic for me) Bournvita Ice Cream Sandwiches (Parle-G cookies with Bournvita chocolate ice cream in between). Their food overall is a fusion of traditional Indian dishes with a modern twist. Check out their bake shop upstairs too – it’s a must! Ritual was on my radar for quite some time so when a group of coworkers of mine working in Houston at different client sites wanted to go here, I was all for it! 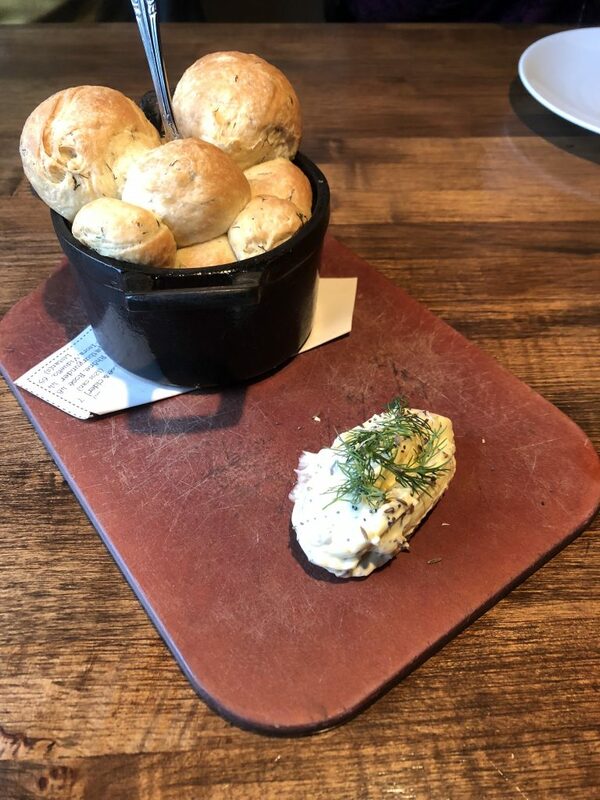 On Wednesdays, if you sit at the bar for a drink, they give you a free appetizer (whatever they are cooking up that day)! Incredible deal! This Southern gal saw gumbo on the menu so you bet I ordered it! 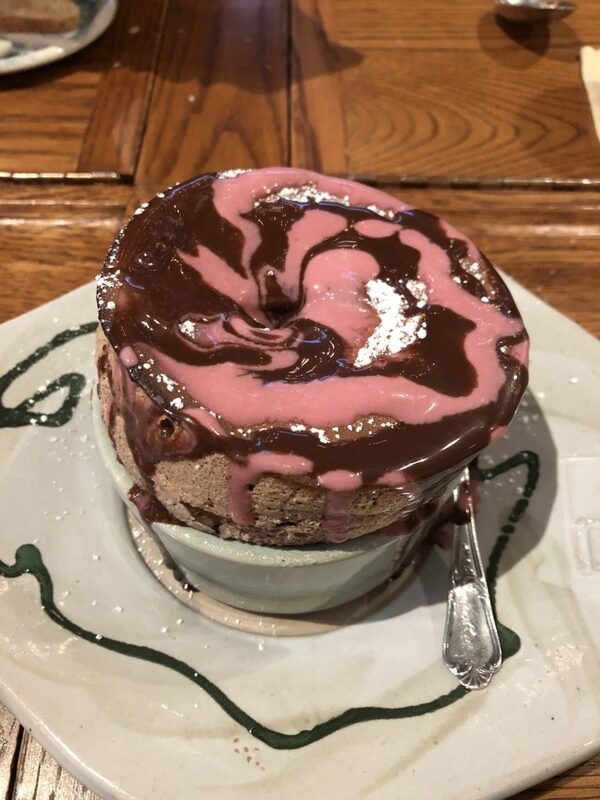 And boy was it delish! And their charcuterie board is the largest I’ve ever seen. Two of us shared it and we had so much leftover! 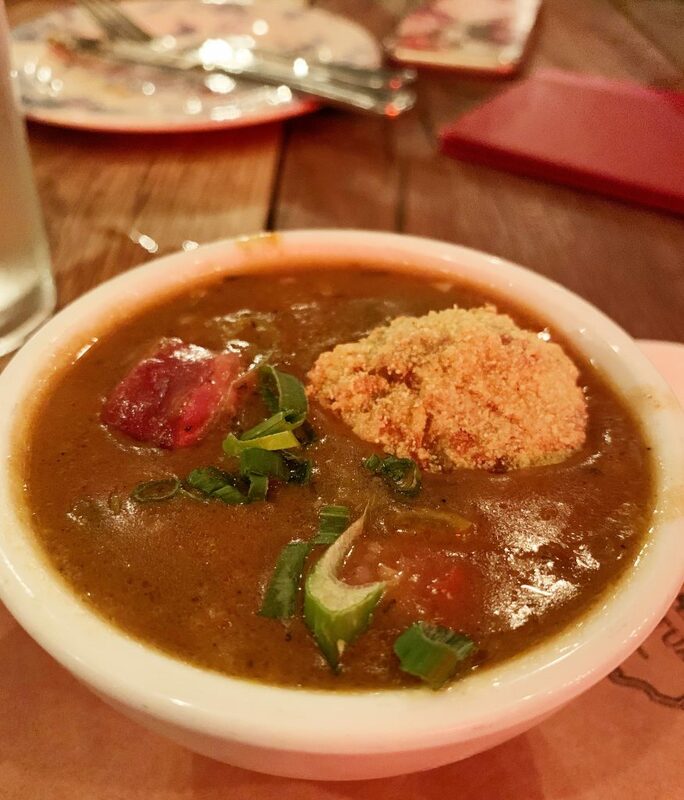 The prettiest and most delish cup of gumbo! 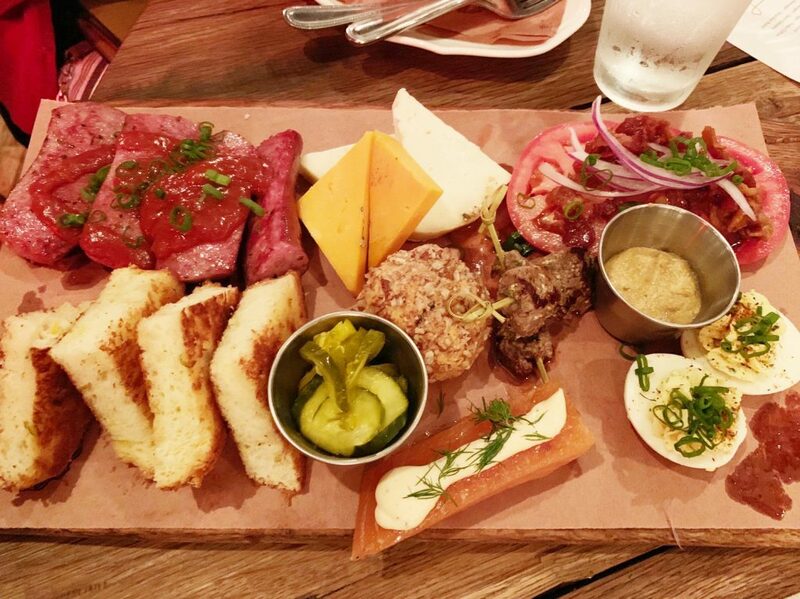 This charcuterie board was GIANT! Probably my favorite patio spot in Houston where you can sip on a glass of whatever and have an incredible view of Downtown Houston is Poitin. And their patio is HUGE. So is the inside of the restaurant – which looked like a great spot to host some large gatherings! 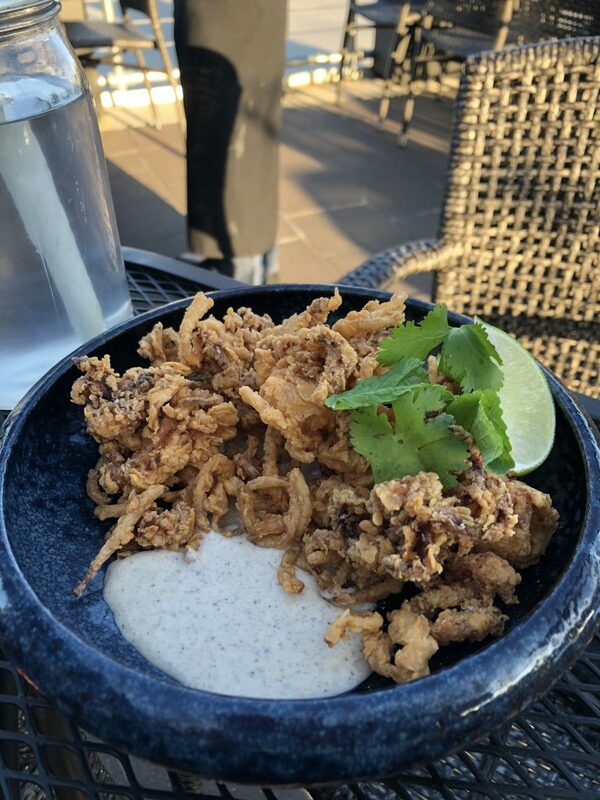 Crispy calamari – just like I like it! It’s super cute inside. They don’t take reservations so if you wanna dine there, go early because the space isn’t large. They have a really nice patio space that I need to check out when the weather is better. 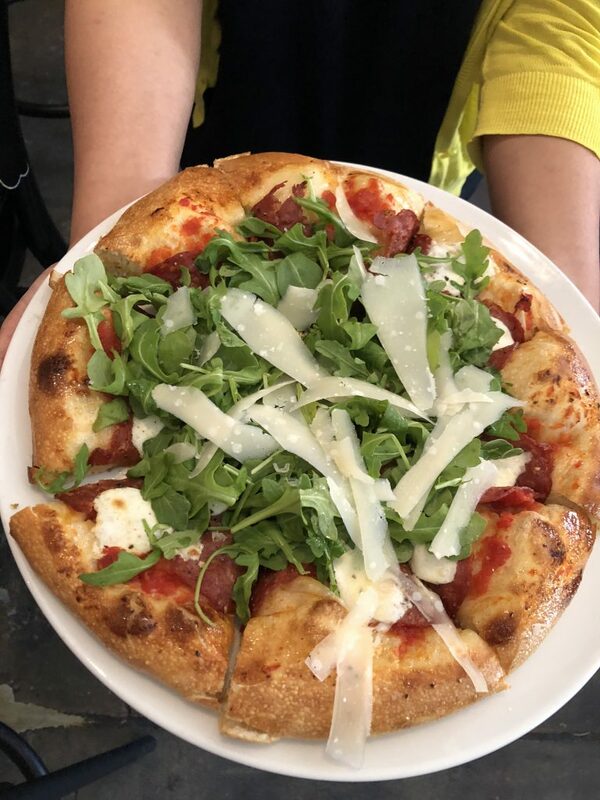 The Dilly Bread – you better order it. 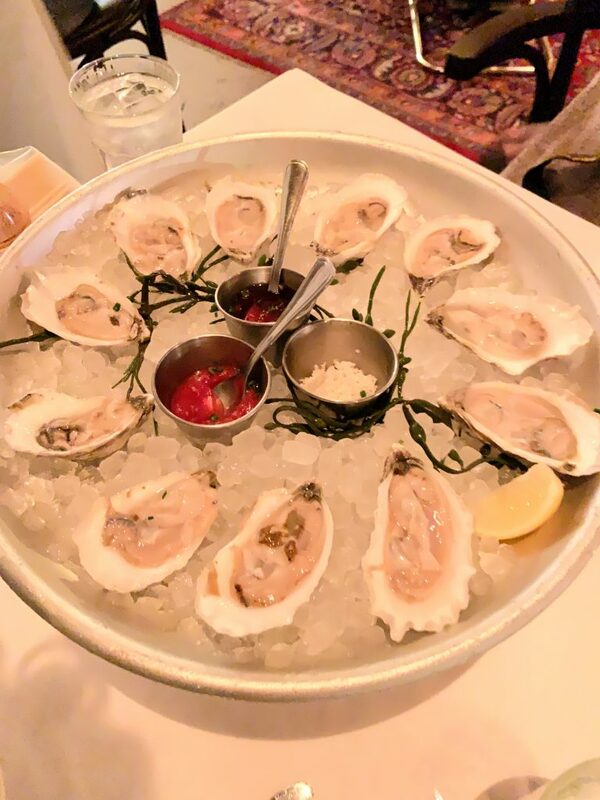 The Awe Shucks – au natural and je ne sais quoi style – ridiculously delish! Y’all, you might not find this funny but I sure as heck do. I went to Helen in the Heights with my friend Helen WHO LIVES IN THE HEIGHTS! Bahahahahahaha! Ok enough laughs! Anyway, if you love Greek food in a nice dining setting, Helen in the Heights needs to be on your list. Again, went during happy hour (which they’ve got a killer one) and had a glass of Greek wine – which was really good! 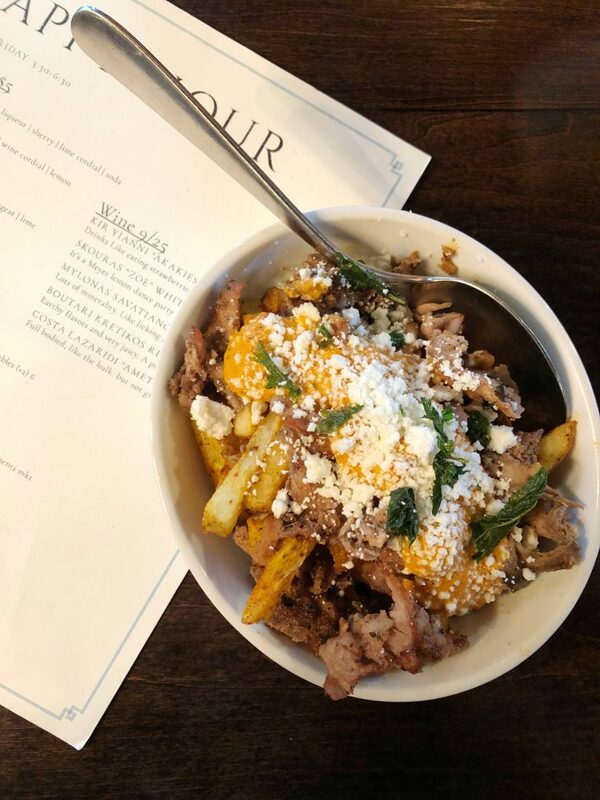 They’ve got GREEK POUTINE, y’all. Imagine fries with gyro meat on top and cheese and all the flavors! Loved their trio of dips too. And their meatballs! We also checked out the original Helen Greek Food and Wine in Rice Village. Cute spot, smaller, make a reservation! Equally yummy food! 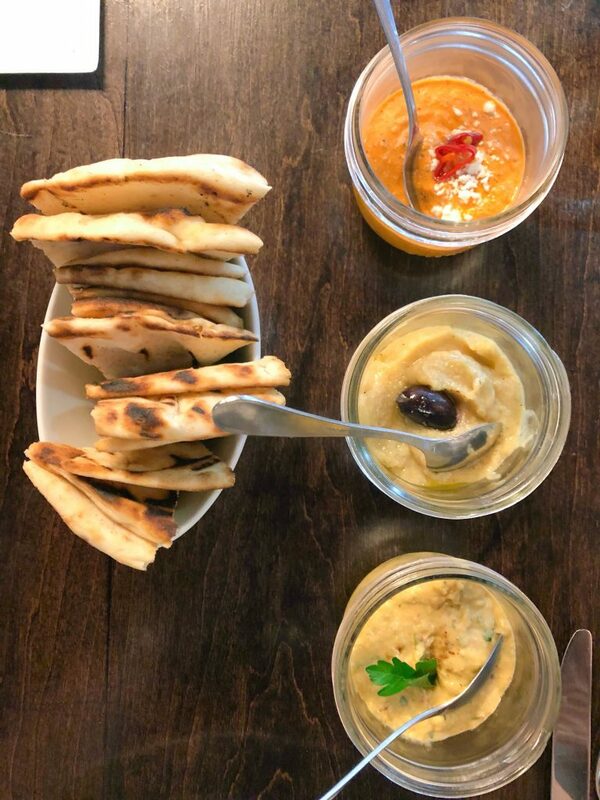 Trio of dips – 2 kinds of hummus and an eggplant dip. Their pita bread is addictive. Greek Poutine – gonna just leave this right here for you to drool. If you’ve read this far, you’ve noticed we’re slowly making our way all over downtown and surrounding Houston. The Heights is close to downtown and has quite the food scene. It reminds me a lot of East Austin (for those of you who live in Austin, you know what I mean). BCK Kitchen didn’t disappoint. A unique experience serving up “food for the soul, inspired by family memories and travel adventures”, we definitely tried those dishes which were nostalgic for us. From the Snacks on Snacks section, we had the Street Corn (so good and cheesy), Peking Duck Tacos, and Buffalo Cauliflower. 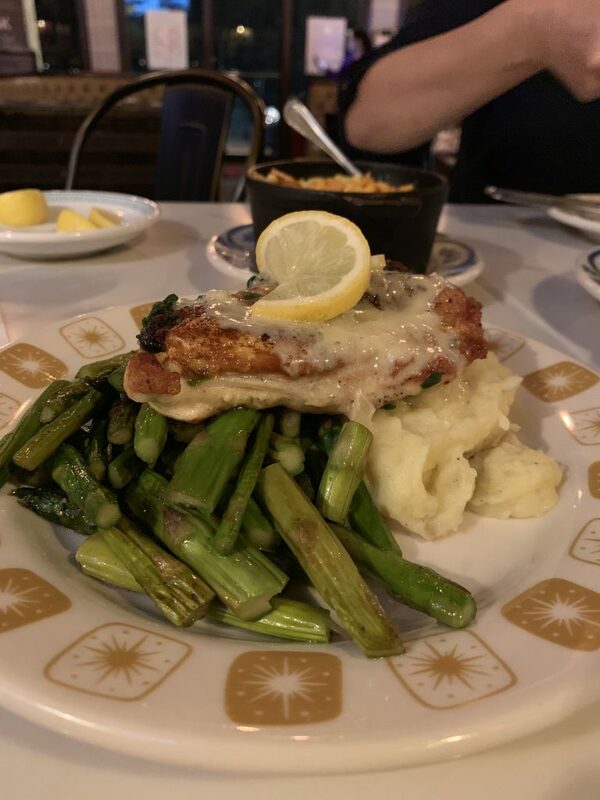 From the It’s What’s For Dinner section, we shared the Lemon Butter Chicken – the chicken was stuffed with spinach and it was super tender and juicy! I was most excited to try the Mac n Cheez It because I ate a ton of cheezits growing up (who didn’t?!?!) and when I saw this was elbow mac n cheese with a cheezit crust, I was intrigued. It didn’t disappoint. 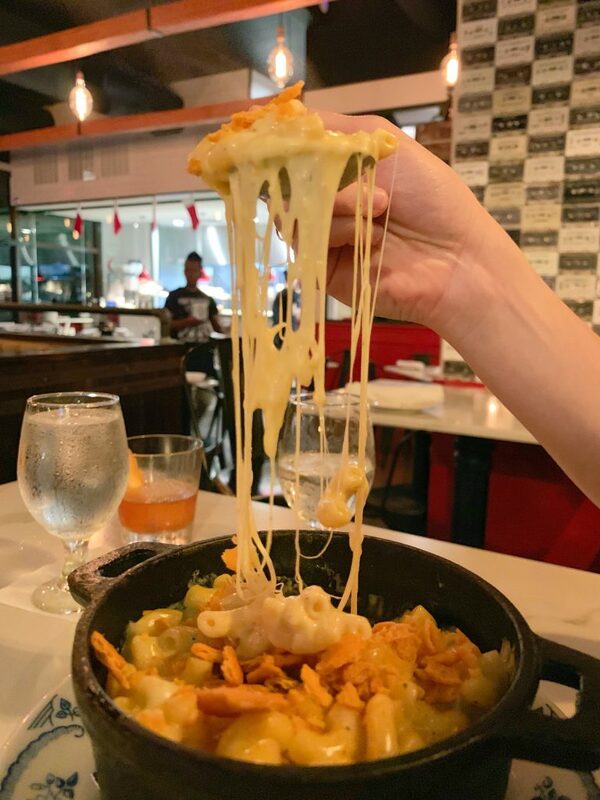 Look further down for a pic of that cheese pull. Last but not least, we practically eat breakfast, lunch and dinner at Finn Hall, the newly opened food hall that’s literally right behind the hotel where I stay every week. It’s a giant food hall, in a historic building, with so many well-known Houston restaurants that were trucks now brick-and-mortars. They’ve got 2 bars serving up beer, wine and cocktails. They’ve even got a few spaces available for large events! I’m so excited to share why I love this place with you! 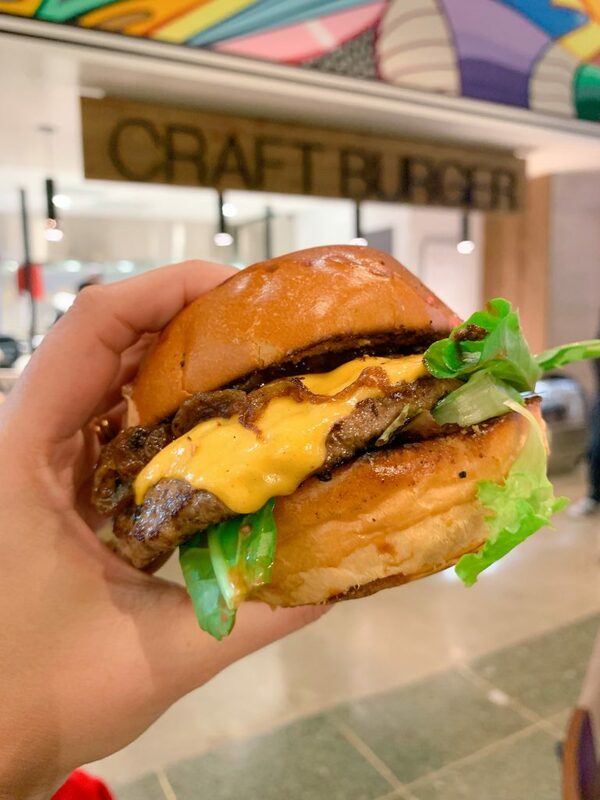 While they’ve got a food truck, Craftburger is also located in Finn Hall and I couldn’t be happier for some gourmet burgers AND FRIES! They’ve got truffle fries, loaded fries, onion rings, LAMB POUTINE! 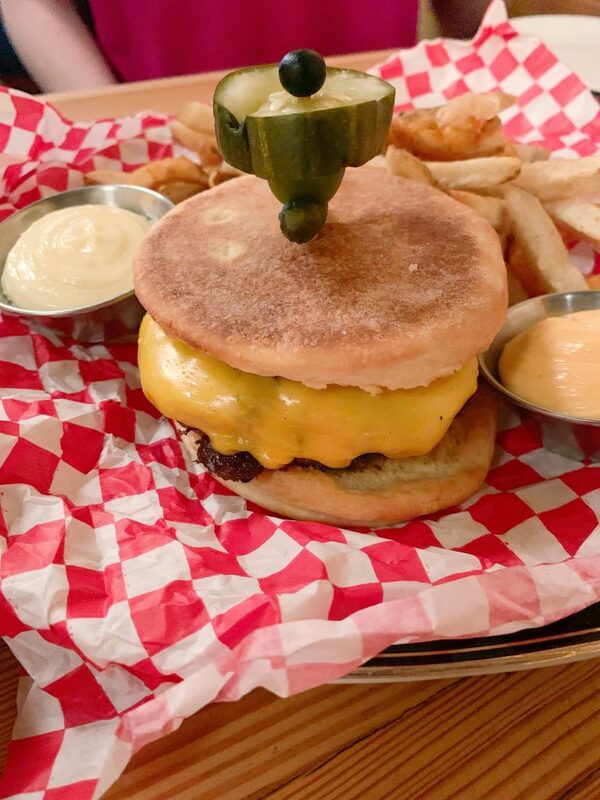 All American Burger – really loved it and that bun is exceptional! 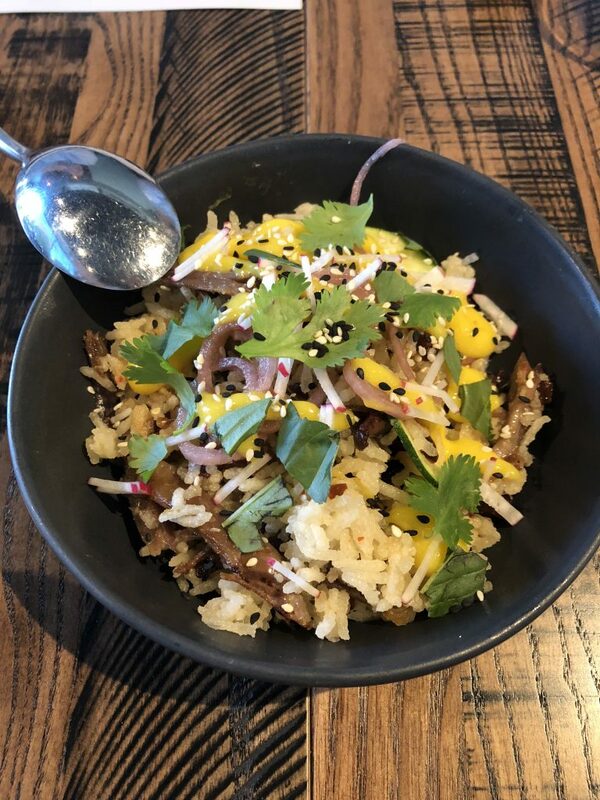 I’ve dined at Dish Society in Katy and by The Galleria many times so needless to say, when I heard they were opening up at Finn Hall, I was ecstatic. Hello brussel sprout salad and Brisket Stuffed Sweet Potato! 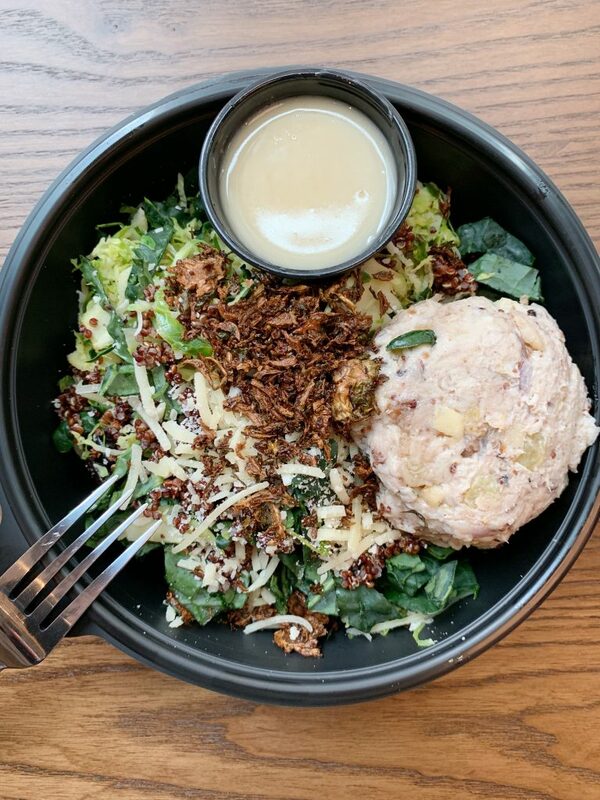 My go-to at lunch is their Brussel Sprout Super Salad with a scoop of chicken salad. It’s an expensive lunch but extremely fresh and delish so I don’t mind. 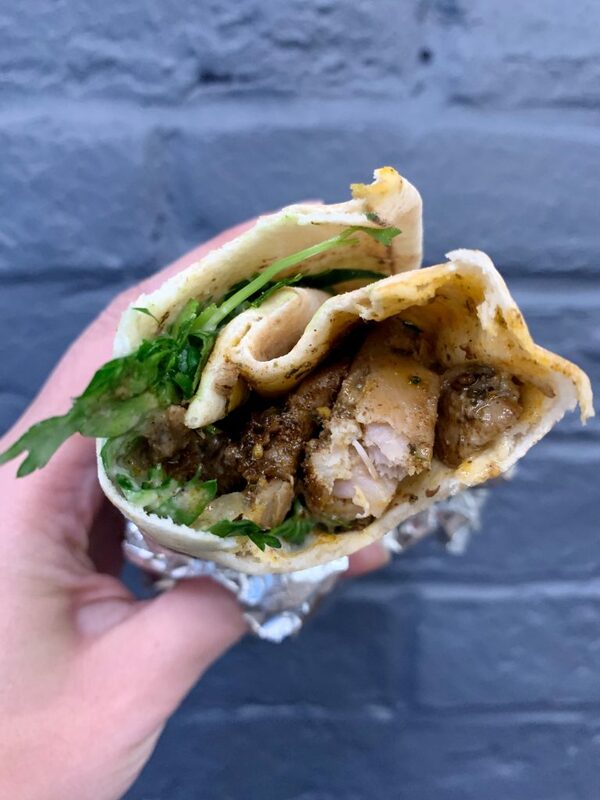 Once located at the Urban Harvest Farmer’s Market but now serving up the fan favorite, falafels, 7 days a week at Finn Hall, Oddball Eats has quickly become my go-to spot for falafels and shawarmas! You can watch them prep the freshest ingredients all day and you’ll never have to worry about eating “old” food. Everything is made-to-order. I’m a huge shawarma fan and had their Chicken “Shawarma” Sandwich that comes with a side of sumac pita chips. It’s by far my favorite shawarma ever eaten. And I’ve eaten my fair share all across the U.S. The sumac pita chips are insanely good too. Take them to-go if you’re full. They aren’t meant to be wasted. 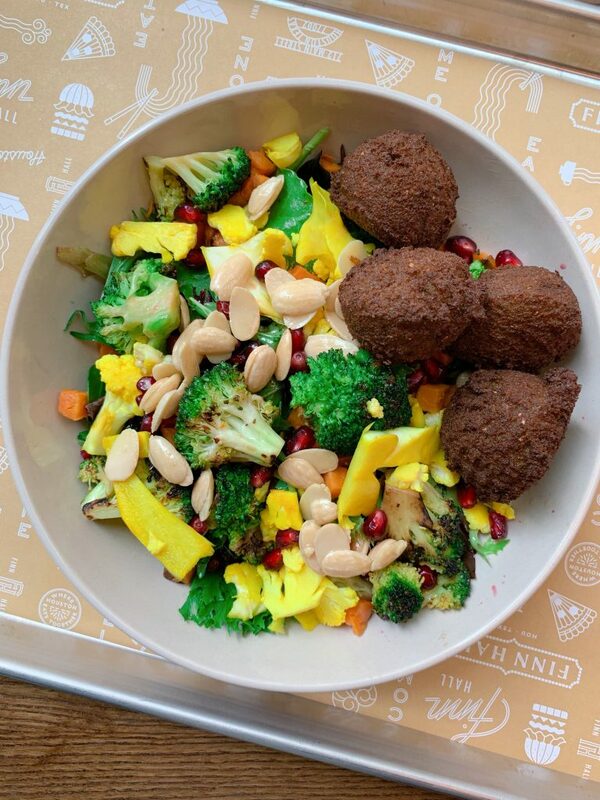 Seasonal Salad with Falafels – holy wow…there are pom seeds in there too. Chicken “Shawarma” Sandwich – literally the very best I’ve ever eaten. 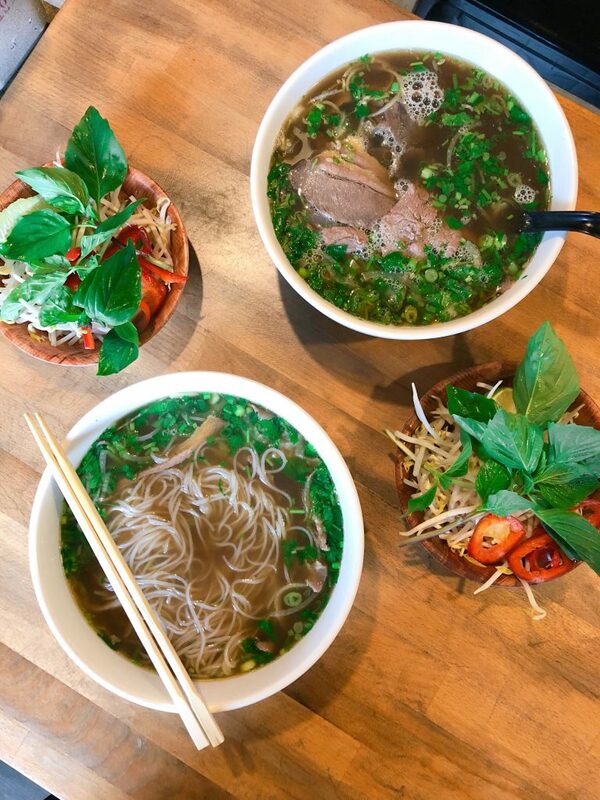 From banh mi, to pho, to potstickers and VIETNAMESE TOTS, SitLo is becoming a regular spot for those moments I want a hearty sandwich aka BANH MI. I have to go back and try the tots, potstickers and their shaking beef, but I’m not worried, there is plenty of opportunities for me to do so. 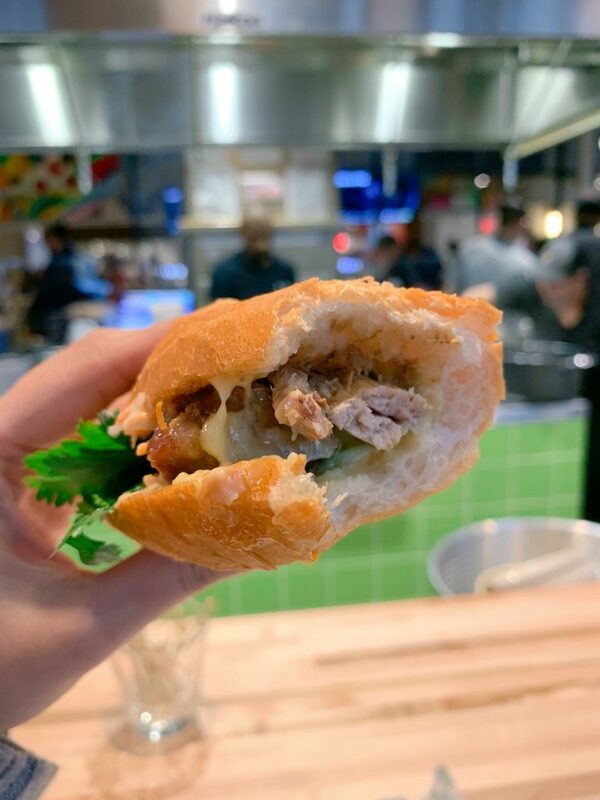 Stand-out right now is the grilled chicken banh mi. It’s really good. And that french baguette is woah! There are several other restaurants at Finn Hall which I have yet to visit…will keep you posted here as I do! A visit to this neighborhood dinette is a must! 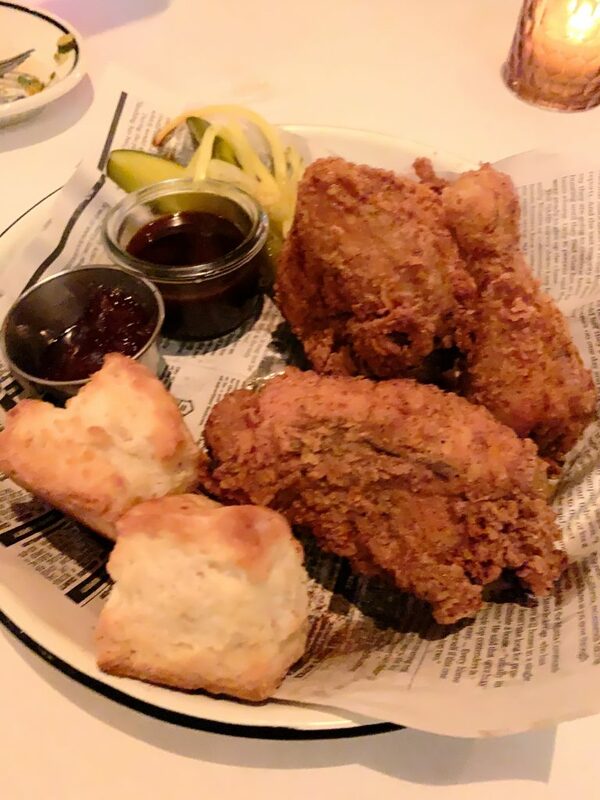 La Lucha is a homage to Ford Fry’s childhood visits to the San Jacinto Inn, famous for their fried chicken and Gulf seafood! 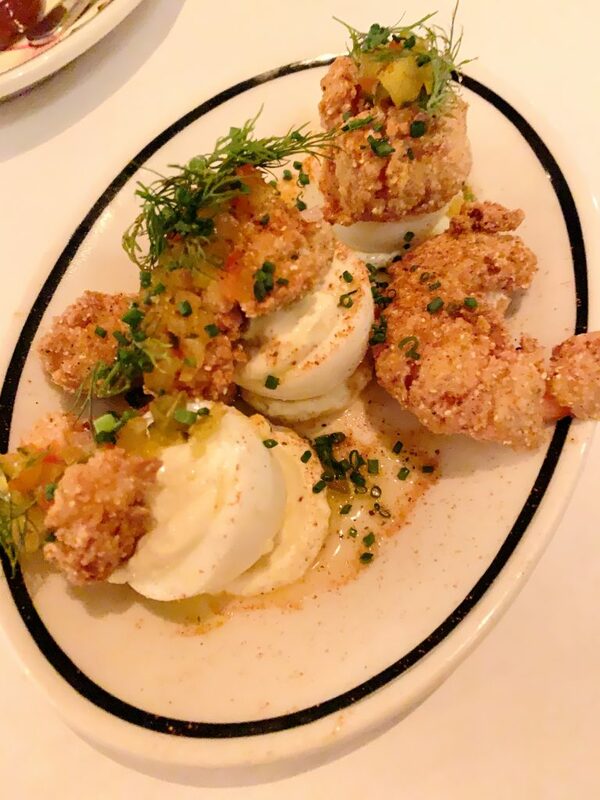 Of course, this Southern gal had OYSTERS, DEVILED EGGS WITH FRIED SHRIMP and FRIED CHICKEN AND A BISCUIT! 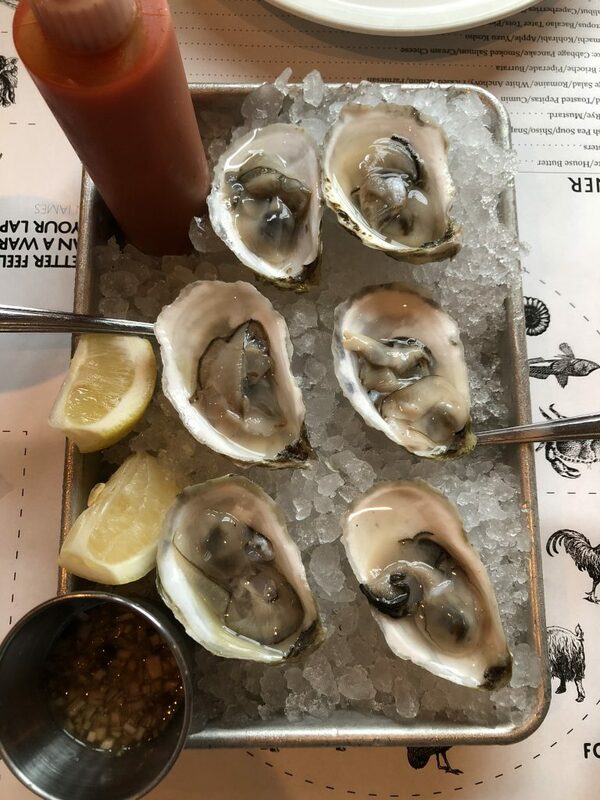 These Murder Point oysters were perfection! Go for happy hour and take advantage of the discount! If ever there was a perfectly cooked piece of FRIED CHICKEN, La Lucha has it! And enjoy a biscuit or two. And get all the sauces! 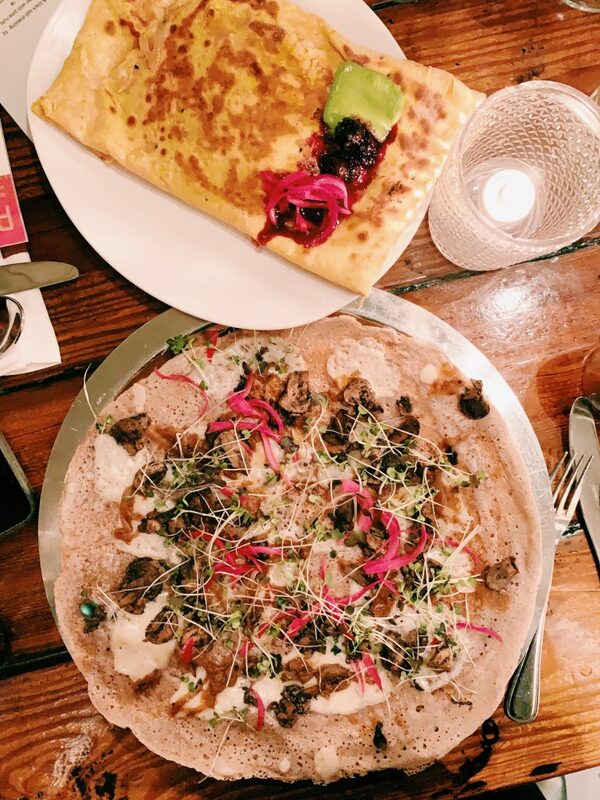 As my time is winding down in Houston (almost a year), I’m trying to make my way down my must-dine at spots in Houston and Nancy’s Hustle has been at the top of my list! If you haven’t been there yet, you’ve gotta bring it to the top of your list and go asap! It was truly exceptional. Probably one of the most amazing meals I’ve had in Houston so far. The environment is warm, open, bright, earthy and laid back. 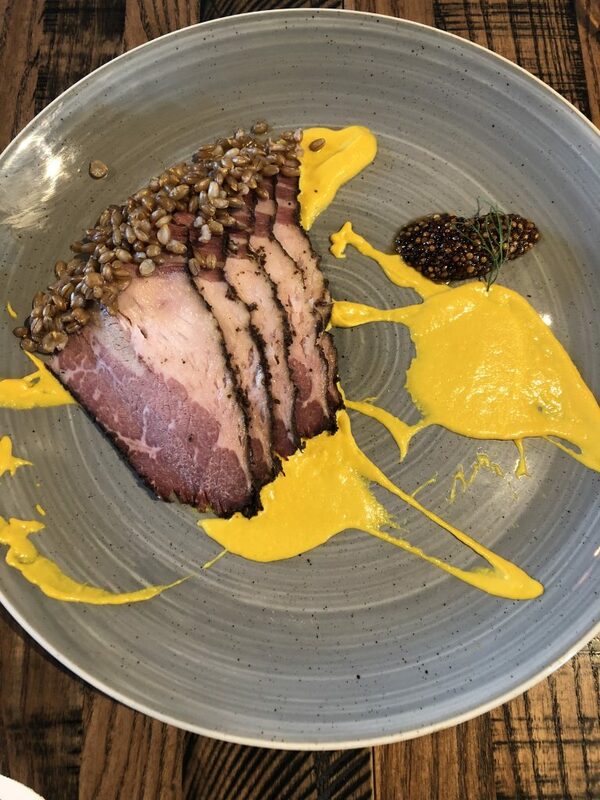 The food is impeccably presented and each dish is exceptionally curated to hit the high note of every ingredient for the perfect balance of flavors and textures. If you make it in before 6PM, enjoy happy hour pricing on select cocktails and 20% off wine bottles. We ordered the brussel sprouts, sourdough tagliatelle, grilled snapper, and the burger. EVERY ONE OF THESE DISHES was perfectly executed and had us wanting to finish each morsel. Nothing was left…sorry leftovers…none here. They make the sourdough tagliatelle and the brioche english muffin for the burger in house and wow, can we talk about how much I want someone to make those for me everyday?! I wish they sold the brioche english muffin because I’d buy that and make every dang sandwich on it from now until eternity. Ok, so are you convinced that you’ve gotta eat there STAT?! Head on in peeps! 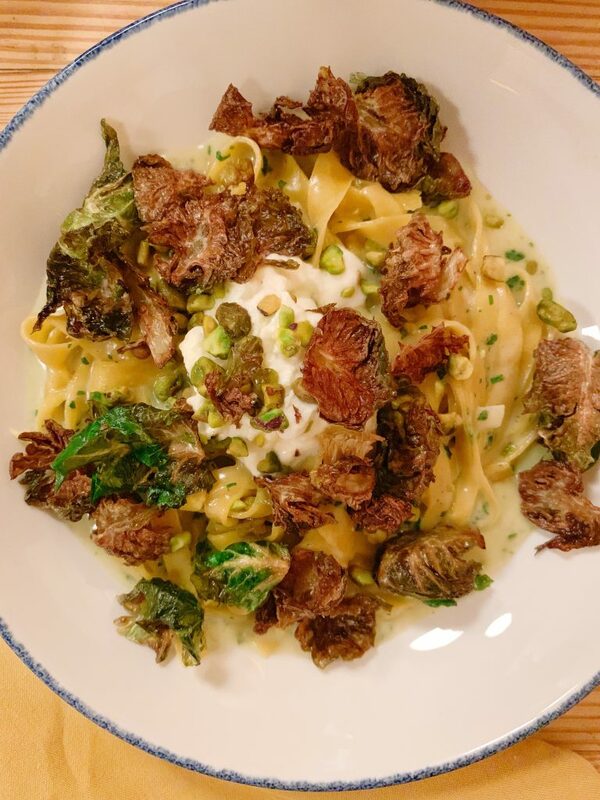 Gah, this sourdough tagliatelle was everything! Hello, burger on a Brioche English Muffin! Well, that’s it for my roundup of Houston eats but I promise to add to it as I explore more of the noteworthy restaurants in Houston. If you have recommendations for places I MUST visit, comment below please. This entry was tagged ATXBitesWorksInHouston, diningguide, food, foodie, Houston, HTX, TexasFood, traveleats.